Žlahtič, M., and Humar, M. (2017). "Influence of artificial and natural weathering on the moisture dynamic of wood," BioRes. 12(1), 117-142. Wood that is used in outdoor applications is frequently exposed to weathering and is thus prone to fungal degradation. Ways to prevent fungal degradation include keeping the wood dry. The majority of hydrophobic and wood modification systems have been tested only on freshly treated wood. Little information is available on how various wood-based materials perform after a certain period of weathering. To elucidate this question, 17 wood samples were tested from the following species: oak (Quercus), sweet chestnut (Castanea sativa), European larch (Larix decidua), Scots pine heartwood and sapwood (Pinus sylvestris), Norway spruce (Picea abies), and beech (Fagus sylvatica). Moisture performance of the wood samples was improved with thermal modification, wax, oil, and biocide treatment. Specimens were exposed to various degradation-aging factors (blue stain fungi, decay fungi, artificial weathering, and natural weathering). Various moisture performance tests were applied before and after aging: short-term water uptake (tensiometer), long-term water uptake, water vapor tests, drying tests, etc. The water exclusion efficacy of wood was decreased after aging. Aging factors were found to act synergistically and to have a more prominent influence on less durable wood compared to durable or preservative-treated wood. Wax-treated wood performed best, regardless of which moisture performance test was applied. In spite of the huge progress in the development of materials, wood is still one of the most important building materials used worldwide. In recent years, the use of wood in above-ground applications, particularly in use Class 2 (outside, not in ground contact, covered) and use Class 3 (outside, not in ground contact, not covered) applications (EN 335 2013) has increased considerably. Modern trends stimulate the use of wood even in applications in which wood has not been traditionally used (bathrooms, multi-story buildings, etc.). In the past, predominantly durable species from the tropics and preservative-treated wood have been used for outdoor applications (Connell 2004). Due to increased environmental awareness, users are looking for alternatives. The development of a new generation of wood-based materials enables the use of less durable wood in damper applications (Esteves and Pereira 2009; Hill 2011; Žlahtič and Humar 2016). A major limitation of wood is its susceptibility to degradation due to UV radiation, fungal and bacterial decay, and insect and termite attack. Poor moisture performance is sometimes an additional limitation for the use of wood in a moist climate. Moisture changes result in swelling and shrinkage. However, even more challenging is the fact that moist wood is susceptible to fungal decay (Van Meel et al. 2011; Meyer and Brischke 2015). The ability of microorganisms to degrade wood is in strong correlation with the moisture content of the cell wall (Schmidt 2006). The moisture content must be optimum because wood can be too wet or too dry for decay (Rowell 2012). However, the minimum required moisture content for fungal growth varies depending on the fungal and wood species. In general, the wood moisture content should be close to fiber saturation to enable fungal growth (Williams and Feist 1999; Meyer and Brischke 2015). The most recent studies have indicated that fungal decay can be reduced or fully prevented if the moisture content is reduced and kept below the critical value of approximately 20% for untreated wood species and down to 15% for modified wood (Meyer et al. 2015). There are two types of water in wood. The “water of constitution” is the water included in the chemical structure of the wood, and it is inherent to the organic nature of the cell walls. This form of water cannot be removed without modifying the chemical composition of the wood. The second type of water comes in three forms: (a) “bound” or “hygroscopic” water, which is adsorbed into the cell walls in the amorphous areas of cellulose, hemicellulose, and lignin; (b) “free” water, which is liquid water in the cell lumen and voids; and (c) “vapor” water, which is present in voids and cell lumen unless the wood is completely saturated (Hartley 2011). Wood moisture content, water exclusion efficacy, and wetting dynamics considerably influence the service life of wood (Brischke et al. 2013). In addition to biocides and biologically active extractives, hydrophobic substances and moisture performance of wood contribute to the overall performance of wood in outdoor applications. Solutions to limit the tendency of wood to absorb water and to change the dimensions can be divided into two categories: (1) water repellents and (2) dimensional stabilizers. The effectiveness of water-repellent treatments can be defined as the ability of a treatment to prevent or control the rate of liquid water uptake (Stamm 1964; Kumar 1994). Dimensional stability depends on the extent rather than the rate of water uptake (Rowell and Banks 1985). The ability to repel water is imparted by wax, oil, or a similar water-repelling substance (silicones, silanes, etc.). Water repellents are regarded as being suitable for application on wooden components in aboveground applications (use Class 3, EN 335 (2013)) in temperate climates, where they are not exposed to frequent wetting. They are not suitable for protection of wood exposed in the ground or under tropical conditions with high rainfall and, consequently, higher moisture loads (Brischke and Melcher 2015). Treatment with water repellent improves the fungal performance of wood in aboveground applications and also improves the weathering performance and dimensional stability of exposed lumber (Wu and Zhang 1999; Lesar et al. 2011; Chau et al. 2015). Water repellents and dimensional stabilizers also reduce cracking and warping (Williams and Feist 1999). Cracks are critical points for decay development, so their absence contributes to a longer service life of wood. Another solution to reducing water uptake is wood modification. Various chemical, thermal, surface, or impregnation treatments have been developed (Hill 2006 and 2011). Among these treatments, thermal modification, acetylation, and impregnation with furfuryl alcohol have been the most commercialized (Militz 2015). Various mechanisms are utilized to improve the sorption properties of modified wood: degradation of hemicelluloses and crosslinking of OH groups (thermally modified wood) (Pétrissans et al. 2003), reaction of OH groups with modification reagents (acetylation, furfuryl alcohol), and blockage of wood cells and/or cell lumina (furfuryl alcohol). Various standardized and non-standardized methods for determining the wetting ability of wood have been reported (Van Acker et al. 2014), but current European standards provide no guidance for utilizing them (Brischke et al. 2015). For elucidating moisture performance, there are many reproducible methodologies that have clearly defined conditions, but there is a risk of creating severe test scenarios, or “torture testing” (Brischke et al. 2011). Field tests, on the other hand, provide more realistic test conditions, but often suffer from unacceptably long test durations (Brischke et al. 2013). The majority of the published and previously cited literature describes the efficacy of hydrophobic treatments and modified wood a short time after treatment. There is relatively less known how these materials perform after exposure to various abiotic (UV, rain, temperature changes) or biotic factors (bacteria, mold, and staining fungi, degradation fungi) in use. The object of the present research was to elucidate changes in the water exclusion efficacy of wood after exposure to various abiotic and biotic decay factors. The prime question is how weathering, blue staining, and incipient wood decay influence the wetting ability. If these factors decrease wetting ability, this would clearly show that weathered wood is more susceptible to fungal decay. Even more, if incipient wood decay occurs, the presence of decay and decreased water exclusion efficacy will act synergistically, which will likely result in faster failure of the wood. In a previous paper (Žlahtič and Humar 2016), greater emphasis was placed on surface properties and the hydrophobicity of wood influenced by artificial and natural weathering. It was clearly demonstrated that abiotic degradation (artificial accelerated weathering) had a more prominent effect on hydrophobicity than biotic factors (wood decay and blue stain fungi). Abiotic and biotic factors of degradation also acted synergistically, as shown by the comparison of contact angles on outdoor weathered and artificially accelerated weathered materials. However, durable (naturally or artificially) materials retain their hydrophobic properties during the aging process much better than susceptible wood species. In the present paper, the influence of artificial and natural weathering on the moisture dynamic and water exclusion efficacy (sorption properties, short-term, long-term water uptake) of wood is presented. It is of great commercial interest to elucidate the most effective hydrophobic treatments that retain their mode of action after severe weathering. This research is a follow-up of a previously published article (Žlahtič and Humar 2016). The experiments were conducted on the same set of specimens. The preparation of the specimens and aging procedures were described in detail in Žlahtič and Humar (2016). The wood species chosen for this study are important in Central Europe, namely, oak heartwood (Quercus sp. ), sweet chestnut heartwood (Castanea sativa), European larch heartwood (Larix decidua), Scots pine heartwood and sapwood (Pinus sylvestris), Norway spruce heartwood (Picea abies), and beech (Fagus sylvatica) wood (Table 1). Specimens were defect-free, without visible signs of decay or blue staining, as prescribed in standard EN 113 (2006). The dimensions of the specimens were 1.5 cm × 2.5 cm × 5.0 cm. Some of the wood samples were subsequently treated with various solutions or thermally modified. The wood samples were classified into various durability classes as prescribed in standard EN 350 (2015), to cover all of the durability classes with the exception of the most durable wood. Oak and sweet chestnut are durable species (2nd class), and heartwood of European larch and Scots pine are moderately durable species (3rd class). Norway spruce are classified as less durable (4th class), and beech and Scots pine sapwood are classified as non-durable species (5th class). Seventeen different wood samples were prepared for this experiment. In total, 1020 specimens were prepared (Table 1). There were five parallel specimens for each wood sample and aging test, and 10 control specimens (60 specimens made from each wood sample). Thermal modification was performed according to the commercial Silvapro® process (Rep et al. 2012). Durability and to a certain extent even water exclusion efficacy was improved with this modification. 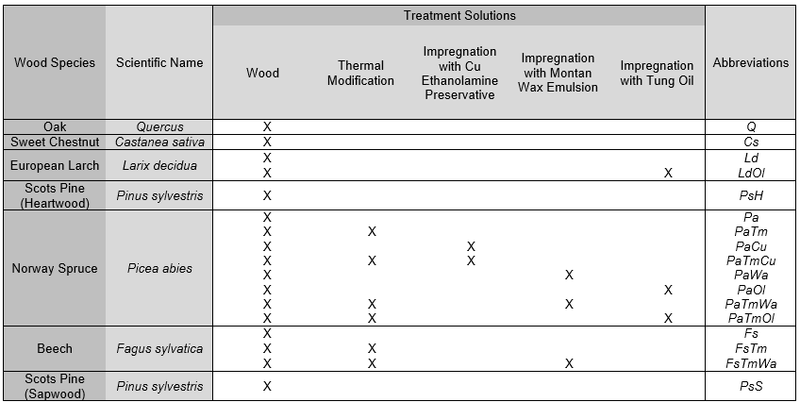 Selected samples, shown in Table 1, were impregnated with various solutions including: (1) 10% suspension of natural wax (Lesar and Humar 2011); (2) tung oil (Humar and Lesar 2013); and (3) commercial copper-ethanolamine formulation (CuEA) (Silvanolin, Silvaprodukt) (Humar and Pohleven 2008). Wax and oil treatment was used to improve water exclusion efficacy, while copper-based treatment was utilized for improvement of durability. Impregnation with all treatment solutions was performed, according to the full cell process. After impregnation, specimens were conditioned for four weeks. Details are described in the first paper from this research (Žlahtič and Humar 2016). Four types of standardized and non-standardized aging procedures were applied. A list of aging procedures with respective abbreviations is given in Table 2. The first aging simulation was incipient fungal decay. The wood was inoculated with 2 fungal species, brown rot (Gloeophyllum trabeum – Gt2) and white rot (Schizophyllum commune – Scc); these two fungal species are usually the first to appear on specimens exposed in the field test site in Ljubljana (Lesar and Humar 2010). One set of specimens was exposed to mixtures of blue stain fungi Aureobasidium pullulans and Sclerophoma pithyophila (Blue SF), one set to artificially accelerated weathering (AWW) (ATLAS UP, Suntest XXL+), and the last set of specimens was exposed to outdoor weathering (OutDW) in the field test site of the Department of Wood Science and Technology, Biotechnical Faculty, Ljubljana, Slovenia. The Scheffer Climate Index in Ljubljana is 55.3 (Scheffer 1971). Prior to and after all aging procedures, conditioned specimens were oven-dried at 103 ± 2 °C until a constant mass was achieved and weighed to determine oven-dry mass. Wax applied is stable up to the 170 °C so oven drying does not affect its properties (Humar et al. 2016). Aging procedures are described in detail in Žlahtič and Humar (2016). Mass change, color measurements, FTIR spectroscopy, and contact angle measurements were described previously (Žlahtič and Humar 2016). These procedures of wood surface characterization elucidate changes in surface properties due to artificial and natural weathering. In the current article, more emphasis was given to the moisture dynamics of wood. Methods such as short-term capillary water uptake test, long-term water uptake, drying process on freshly activated silica gel, water vapor uptake in water saturated atmosphere, and sorption test were performed. The tests were designed to simulate the moisture performance of different wood samples in aboveground outdoor applications. These tests are fast, reliable, and provide an indication of wood behavior under real life situations, while outdoor tests are much more time consuming. Brischke and co-authors (2013) showed that, in general, poor outdoor performance and moisture performance are connected. The measurements were carried out at room temperature of 20 °C at a relative humidity (RH) of 50% ± 5% on a Tensiometer K100MK2 device (Krüss, Germany), according to a modified EN 1609 (1997) standard, after conditioning at 20 °C and 65% RH until constant mass. The axial surfaces of the specimens were positioned to be in contact with the test liquid, and their masses were subsequently measured continuously every 2 s for 200 s. Other parameters used were: velocity before contact 6 mm/min, sensitivity of contact 0.005 g, and depth of immersion 1 mm. Depending on the final weight of the immersed sample and the square surface of the axial surface of specimens, the uptake of water was calculated in grams per square centimeter. Long-term water uptake was based on the ENV 1250-2 (1994) leaching procedure. Before the test, specimens were oven-dried at 103 ± 2 °C until constant mass and weighed to determine the oven-dry mass. Dry wood blocks were placed in a glass jar and positioned with weights to prevent them from floating; 100 g of distilled water was then added per specimen. The water was replaced six times in five subsequent days, as prescribed by the standard. The mass of the specimens was determined after 1, 3, 7, 16, 24, 48, and 95 h, and the moisture content of the samples was calculated. In addition to wetting, outdoor performance is also influenced by drying. Wood that dries out quicker in general performs better. Wet specimens were thus positioned above freshly activated silica gel for 10 days in a closed plastic container. Because there was a large amount of data, the results were only reported as average moisture content after 1, 24, and 95 h of soaking in distilled water and after 72 h of drying. These values were the most descriptive. In addition to liquid water uptake, wood also absorbs water from the air. An experiment was performed to determine the performance of wood in a climate with high relative humidity. Specimens were oven-dried at 103 ± 2 °C to a constant mass and weighed to determine oven-dry mass. The specimens were stacked in a glass climate chamber with a ventilator above distilled water. Specimens were positioned on plastic mesh above water using thin spacers (Brischke et al. 2015). After 24 h of exposure, they were weighed again, and their moisture content was calculated. Specimens were then left in the same chamber for an additional 3 weeks until a constant mass was achieved. All results were statistically analyzed within the aging process using ANOVA (Newman-Keuls multiple range test, p = 0.95) by a computerized statistical program (Statgraphics Centurion, Warrenton, VA, USA). Multiple range tests determined the significance of differences between the mean values at a 5% significance level and were carried out separately for each method in different aging tests. The results were divided into groups of 6 (A, B, C, D, E, F, and G, H, I , J, K, L) on the basis of statistical groups. Water exclusion efficacy (WEE) is a parameter that explains the performance of some wood species with a lower extractive content, such as Norway spruce, in aboveground applications. There is no single measurement to describe the WEE of wood, but one indicator of WEE is short-term water uptake, determined with a tensiometer. However, this test was performed on axial surfaces only. Wood is much more permeable in a longitudinal direction than in radial or tangential directions (Banks 1972; Rowell and Banks 1985). The ratio of axial surfaces in elements from real case applications was fairly small compared with the specimens used. However, axial surfaces often represent the weakest point of wooden elements in aboveground applications. The short-term capillary water uptake test was performed on all specimens. Average water uptake was calculated according axial surface dimension and is shown in Table 3. A typical curve of water uptake is shown Fig. 1, in which water penetration to Norway spruce wood is presented. Water uptake was highest at the beginning and then tended to slow down. The shape of the curve was typically logarithmic. Approximately half of the water was absorbed after 30 s. Table 3 clearly shows that the wood species used and treatments had a significant influence on the short-term water uptake. Pine sapwood and beech wood are characterized as very permeable species, which was clearly reflected in the present data (EN 350 2015). The highest short-term uptake for non-aged wood was determined with Scots pine sapwood (PsS; 0.21 g/cm2) and beech (Fs; 0.19 g/cm2), followed by copper-treated spruce (PaCu; 0.15 g/cm2), thermally modified spruce (PaTmCu; 0.13 g/cm2), Norway spruce (Pa; 0.12 g/cm2), and oak (Q; 0.11 g/cm2). Copper-ethanolamine based wood preservative contains quaternary ammonium compound, a surfactant that affects wood surface properties (Thaler and Humar 2014). The lowest amount of water penetrated wax-treated (FsTmWa, PaTmWa, PaWa) and oil-treated wood (LdOl, PaOl, PaTmOl). Figure 1 and Table 3 show that wax and oil treatment completely prevented water uptake in the axial direction; even negative water uptakes were determined. This result clearly indicated that wax and oil in the cell lumina block water penetration. Furthermore, the surface of wax- and oil-treated wood was very hydrophobic, which could be seen from the high contact angles reported in Žlahtič and Humar (2016). In the second step, the influence of the various aging factors on the short-term water uptake of wood was examined. Wood inhabiting fungi, particularly staining fungi, appears fairly fast on the surface of wood used outdoors. Blue stain fungi do not degrade wood (Humar et al. 2008); however, when colonizing the wood, hyphae open additional voids in pit membranes. This effect was observed via tensiometer measurements (Table 3). For example, water uptake with blue stained pine sapwood increased from 0.21 g/cm2 to 0.30 g/cm2 after 4 weeks of exposure. A similar effect was also determined with spruce wood and beech wood. However, blue stain fungi did not grow on preservative-treated wood (PaCu, PaTmCu), thermally modified wood (PaTm, FsTm), and hardwoods with high natural durability (Cs, Q). Because fungi did not grow on durable wood, short-term uptake did not significantly increase. However, waxes (FsTmWa, PaWa, PaTmWa) also prevented blue stain spreading in wood, as water uptake in wax-treated specimens remained low. For example, with wax-treated thermally modified spruce (PaTmWa), the short-term water uptake remained insignificant even after exposure to blue stain fungi. In contrast to blue stain fungi, wood decay fungi contain enzymatic systems that degrade wood (Žlahtič and Humar 2016). Exposure of the wood blocks to brown rot fungi resulted in a higher influence on short-term water uptake compared to white rot fungi. The short-term uptake of the majority of the samples exposed to S. commune was similar to control specimens. In contrast, predominantly short-term exposure (Gt2-A) to brown rot fungus G. trabeum resulted in increased water uptakes. This increase was most notable with thermally modified wood (FsTm, PaTm), spruce (Pa), beech (Fs), and pine (PsS). For example, the short-term water uptake into spruce wood specimens increased from 0.12 g/cm2 to 0.23 g/cm2 after 4 weeks of exposure to G. trabeum. Longer periods of exposure did not have a positive influence on water uptake. It was suspected that the remaining brown rot lignin was more hydrophobic and that, secondly, degraded fragments blocked the cell lumen and pit membranes, which had a negative influence on permeability. However, it is clear that initial brown rot decay made axial surfaces more hydrophilic. Partly degraded wood could, therefore, absorb more water than control wood. Hence, as soon as wood was colonized, favorable moisture conditions could be easily established. Additionally, wax-treated wood retained its hydrophobicity, even after exposure to fungi. Furthermore, under laboratory conditions, wax-treated wood showed improved durability against wood degrading basidiomycetes, as previously noted (Lesar and Humar 2011; Scholz and Militz 2011; Brischke and Melcher 2015). Wood used outdoors is constantly exposed to weathering. It is thus very important, from a practical point of view, to elucidate how weathering influences the moisture performance of wood. To exclude the influence of biotic factors, wood was exposed to artificial accelerated weathering. Due to intense UV radiation and high temperatures, the development of fungal or bacterial colonization was unlikely. This was supported by color and FTIR analysis reported in Žlahtič and Humar (2016). The exposure of wood to artificial accelerated weathering (AAW) resulted in increased short-term water uptake in the majority of samples (Table 3). 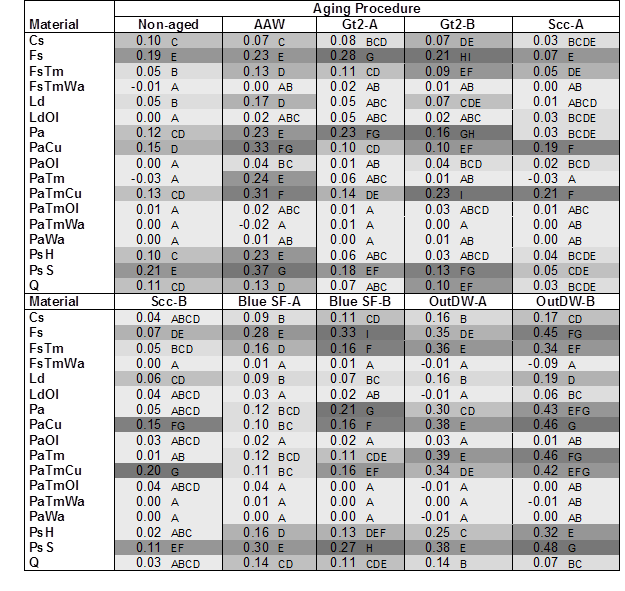 Note: The materials and aging procedures abbreviations are the same as in Table 1 and Table 2. 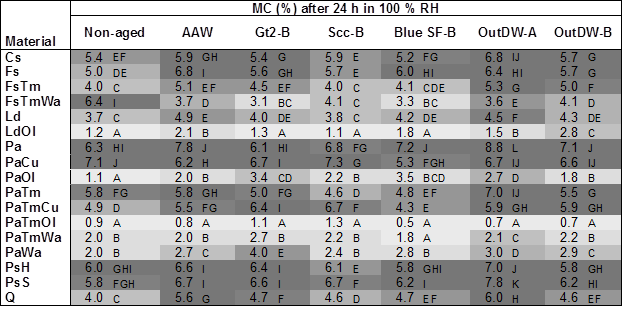 Statistical groups are shown in the column next to the data. The results are divided into groups of 6 (A, B, C, D, E, F, and G, H, I, J, K, L) on the basis of statistical groups. AAW did not have an influence on the short-term water uptake to sweet chestnut and wax and oil-treated wood (PaWa, PaTmWa, FsTmWa). This result confirmed previous observations (Lesar et al. 2011). Wax on the surface absorbed part of the UV radiation and prevented leaching of the depolymerized lignin (quinones) from the wood. However, AAW increased the water uptake in the majority of other wood samples. The highest water uptake was reported for Scots pine sapwood (PsS), where water uptake increased from 0.21 to 0.37 g/cm2. Samples preconditioned in outdoor applications were exposed to a combination of abiotic and biotic factors. It was thus logical that the highest water uptakes were determined with specimens that were exposed to outdoor weathering for 9 (OutDW-A) and 18 months (OutDW-B). From the visual appearance of the samples (Žlahtič and Humar 2016), a grey color indicated the photodegradation of the specimens, while black spots showed the clear presence of molding and staining fungi (Žlahtič and Humar 2016). The changes of the surface properties and changes of water exclusion efficacy were, thus, the result of a synergistic effect of biotic and abiotic degradation factors. Similarly, as reported for AAW and specimens exposed to fungi, the short-term water uptake increased with the majority of specimens, with exception of specimens treated with waxes. As reported for AAW, waxes retained their hydrophobic properties even after 18 months of exposure (OutDW-B). This is very important for use in outdoor applications. However, oil treatment was less effective (Table 3). Similar to AAW, the highest short-term water uptake was determined with Scots pine sapwood specimens (PsS). Scots pine specimens exposed to 18 months of weathering (OutDW-B) took up 0.48 g/cm2 of water, which was the highest short-term water uptake determined. Fairly high uptakes were determined with beech wood (Fs – 0.45 g/cm2), copper-treated spruce (PaCu – 0.46 g/cm2), and thermally modified wood (PaTm – 0.46 g/cm2; PaTmCu – 0.42 g/cm2). This increased water uptake was probably a result of the synergistic effect of blue staining and photo-degradation. This resulted in the degradation of pith membranes, tyloses, formation of cracks, etc. Wood in use (especially in outdoor applications) is exposed to both periodic water absorption and desorption processes. From a performance point of view, it is equally important to slow down wetting and to enable as fast drying as possible. Weathering exposes the wood to contact with liquid water. The wetting and drying cycle of outdoor wood could raise the grain on the surface of wood. This degradation splinters the wood surface and leads to checking and cracking. Checking may increase the uptake of water, thus accelerating degradation (Williams and Feist 1999). Its susceptibility to degradation consequently increases. Wood fungi and other organisms grow in the optimal moisture content. Different wood materials were tested to determine their moisture performance. Short-term liquid water uptake tests were performed on the axial surfaces only; in long-term tests, all sample surfaces were in contact with water. All specimens were immersed in distilled water and their mass was determined at predetermined intervals. Wet specimens were transferred to a plastic container with freshly activated silica gel and weighed several more times. Only the moisture content after 1 h, 24 h, and 95 h of immersion, and after 72 h of drying, is discussed here (Tables 4a, b, c, d, e). Unexposed samples performed similarly as reported for short-term water uptake. In general, samples that performed well within the first hour of immersion retained a similar rank after 4 days of immersion. For example, Scots pine sapwood (PsS) took up the highest amount of water during the first hour of immersion (43.3%) and remained in the group of the most moist samples after 24 h (54.9%) and 95 h (72.8%) (Table 4a). This result was expected, as Scots pine sapwood (PsS) is a very permeable wood species that easily becomes wet (Brischke et al. 2015). In addition to Scots pine sapwood, some other wood species with poor moisture performance were identified. The moisture content of these wood materials after 95 h of soaking with water was worse (Pa; 82.3% and PaCu; 87.2%) or did not statistically differ from Scots pine sapwood (sweet chestnut (Cs; 68.8%), beech (Fs; 69%), and thermally modified spruce (PaTm; 72.9%)). The poor moisture performance of thermally modified spruce reflected that pit membranes degraded during thermal modification and that micro cracks acted like capillaries that take up water (Van Acker et al. 2015; Žlahtič and Humar 2016). The wood materials that performed best were those treated with hydrophobic systems: drying tung oil or montan wax emulsion. Wax and oils formed a film on wood that slowed adsorption significantly. The moisture content of wax-treated spruce after one hour of soaking was 13.9%, while the moisture content of thermally modified spruce treated with waxes (PaTmWa) was 8.3%. The effect of oil was even better (PaTmOl; 4.3%). The moisture content of wax and oil-treated wood remained low even after 95 h of soaking (Table 4a). There were three possible modes of action: (1) treatment with oil and waxes made the surface of the specimens more hydrophobic (Žlahtič and Humar 2016); (2) the cell lumina were at least partly filled with waxes or oils, which prevented moisturizing; and (3) there were thin film-barriers formed on the surface of the wooden specimens, which slowed down water movement (Lesar and Humar 2011). The present research investigated whether wood retained its hydroscopic properties after various aging procedures. The influence of blue staining was in general negative. The water exclusion efficacy of the majority of the specimens decreased after exposure to blue staining fungi, with the exception of copper-treated wood (PaCu; PaTmCu). This was expected because fungicides applied to wood surfaces prevent fungal growth. However, the time of exposure did not have a significant influence on changes in the water uptake after immersion. The majority of the changes in permeability appeared during colonization (Table 4d). White rot fungus S. commune did not have any influence on the long-term water uptake (Table 4c). In contrast to blue stain fungi and white rot fungus, brown rot fungus G. trabeum (Table 4b) had a more prominent influence on water uptake during immersion. This was in contradiction to the tensiometer short-term water uptake measurements. In general, with specimens with higher mass losses, a higher increase in moisture content after dipping was determined. The highest mass losses were determined with Norway spruce (Pa), Scots pine sapwood (PsS), and beech wood (Fs) (Žlahtič and Humar 2016). The moisture content after 24 h of immersion was highest with spruce wood exposed to G. trebeum for 2 months (208%). Lower but still high values were found in Scots pine sapwood (116.9%) and beech wood (122.5%). Brown rot fungus was able to degrade pits and open additional voids in the cell wall, which evidently resulted in more permeable wood. Brown rot decay did not significantly decrease contact angles (Žlahtič and Humar 2016) and short-term water uptake, but it had a considerable influence on the moisture content determined during dipping. However, if decay was inhibited either by the use of biocides (PaCu, PaTmCu) or by the use of naturally durable species (Cs, Q, PsH), the water uptake was unchanged during immersion. Although waxes and oils did not have a pure biocidal mode of action, they prevented fungal decay, although wood impregnated with waxes without biocidal components can be degraded by wood-destroying basidiomycetes (Lesar and Humar 2011; Scholz and Militz 2011; Brischke and Melcher 2015). While the mode of protective action of all water repellents increases hydrophobicity as part of non-biocidal fungal protection, with an increasing number of cracks, the protective action of the wax impregnation is diminished (Brischke and Melcher 2015). This effect could be reduced by thermal modification before impregnation with waxes (PaTmWa). In addition to biotic factors, wood was exposed to abiotic degradation patterns. 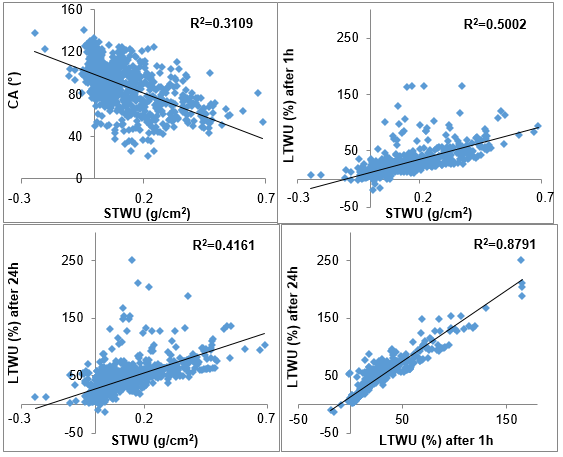 Table 3 shows that AAW had a significant influence on the short-term water uptake in an axial direction. Table 4a shows that AAW also had a significant influence on long-term water uptake. Most of the artificially weathered specimens took up more water within the first hour of immersion than control non-aged specimens. Only the moisture content of wax-treated specimens remained lower or the same after exposure to AAW. It seemed that AAW leaches emulgators from the wax on the surface, which resulted in better moisture performance of wax-treated wood. Good moisture performance of wax-treated spruce in comparison to the non-treated spruce is observed in Figs. 2 and 3. Similarly as reported for short-term water uptake, outdoor exposure acted synergistically. The changes of the moisture performance were not as severe as reported for wood exposed to brown rot fungus G. trabeum, although outdoor weathering had a more significant influence on water uptake than blue staining or AAW alone. Similarly, as reported during other tests, wood species treated with hydrophobic treatments performed best. For example, the moisture content of wax-treated thermally modified wood after 24 h of immersion was 15.8% (non-aged). Exposing these specimens to outdoor weathering for 24 h resulted in even lower water uptakes as a result of the one-day immersion (OutDW-A 13.3%; OutDW-B 11.9%). Good performance of wax and oil-treated wood was also noted for wood species treated with other hydrophobic systems. This clearly showed the excellent moisture performance of both hydrophobic systems used, even after 18 months of outdoor exposure. However, outdoor weathering resulted in decreased moisture performance of the other wood species used. The moisture content of the wood species investigated that were exposed to the synergistic effect of the various abiotic and biotic factors was significantly higher than that of the control, non-aged specimens. The highest moisture content after one hour of immersion was determined with pine sapwood (PsS, 85.3%), which was roughly double the value noted with control specimens (PsS, 43.3%). However, the highest decrease of water exclusion efficacy expressed in percentages was noted for thermally modified spruce (PaTm), with which moisture after one hour of soaking increased five-fold; from 12.9% with control specimens to 66.7% with specimens exposed to 18 months of weathering (OutDW-B). This increase explained the difference between the moisture performance of thermally modified wood determined in laboratory tests and outdoor long-term monitoring (Humar et al. 2014). In the first part of the section, the wetting ability of the materials investigated was determined. However, drying is also important. The duration of wetness depends on the wetting and speed of drying. For fast drying, the duration of wetness is not an issue. One of the questions was, thus, how various degradation factors influenced drying ability. The moisture content after 72 h of drying of the samples that were exposed to wood inhabiting fungi (Blue SF-A, Blue SF-B, Gt2-A, Gt2-B, Scc-A, Scc-B) was similar to the moisture content of control, non-aged specimens. The moisture content after drying depended on the moisture content after 95 h of immersion (higher MC after immersion resulted in higher MC after drying), sorption properties (thermally modified wood species had lower MC after drying), and hydrophobic systems applied (wax applied on spruce wood slowed down drying) (Tables 4a, b, c, d, e). The materials and aging procedures abbreviations are the same as in Table 1 and Table 2. Statistical groups are shown in the column next to the data. The results are divided into groups of 6 (A, B, C, D, E, F, and G, H, I, J, K, L) on the basis of statistical groups. The MC after drying of weathered specimens was higher for most of the wood species. The primary reason for this change was that the moisture contents of the weathered specimens after 95 h of immersion were, in general, higher than after the majority of the other ageing procedures. The only exception was wax and oil-treated wood. The MC values of the wax and oil-treated weathered specimens were comparable to the values determined on the non-aged specimens. To examine the influence of various aging factors on moisture performance, the moisture contents after long-term water uptake and drying above freshly activated silica gel of Norway spruce and wax-treated Norway spruce are plotted in Figs. 2 and 3, which show the excellent performance of wax treatment. Wax-treated spruce showed significantly decreased water uptake regardless of the aging test performed. The water uptake reduction was up to three times lower with wax-treated specimens. However, the same trend was observed on both graphs. The highest MC was determined after 95 h of soaking in distilled water, and the lowest MC occurred after 240 h of drying above freshly activated silica gel, which was expected. In both selected cases, the overall highest water uptake was determined after 95 h with specimens that were exposed to Gt2-B prior to wetting. As a hygroscopic, porous material, wood exchanges moisture with the surrounding air. The rate of exchanged moisture depends on the relative humidity and temperature of the air and on the current wood moisture content. Because of changes in atmospheric relative humidity and temperature, wood is constantly subjected to moisture adsorption and desorption (Ma and Zhao 2012) and concurrent dimensional changes (Chau et al. 2015). The last series of specimens were exposed to a climate chamber with 100% RH for 24 h to see how fast wood absorbed water from the air. This test indicated rapid water adsorption. However, the samples in this stage were put in the chamber in an oven-dry state, and the surface of specimens exhibited high energy. The moisture content after 24 h of conditioning varied between 0.9% (PaTmOl) and 7.1% (PaCu). When those results were compared to liquid water uptake, there were much more uniform results. However, the hydrophobic treatments (waxes and oils) slowed down liquid water and also water vapor diffusion. The MC of the other materials was much more uniform. The results confirmed that it is important to distinguish between liquid and adsorptive water uptake (Brischke et al. 2013). Furthermore, Table 5 shows that aging did not have a very prominent influence on the sorption properties. Only the MC values of specimens that were exposed to artificial (AAW) and outdoor weathering (OutDW-A and OutDW-B) had 1% to 2% higher MC after 24 h of conditioning in a chamber with 100% RH. Thus, the influence of abiotic and biotic degradation factors on sorption properties was not as prominent as on the liquid water uptake. This result was reasonable, as weathering was predominantly a surface phenomenon, while sorption properties reflected the overall characteristics of wood. A second sorption test was performed in which specimens were exposed above liquid water for approximately three weeks until a constant mass was determined. After three weeks of conditioning, almost none of the tested materials exceeded 20%, which is the critical threshold moisture for fungal decay for non-modified wood species (Brischke and Rapp 2008). The only exception was Norway Spruce and Beech, where MC slightly above 20% was determined at some specimens. In general, the MC values of the materials exposed in 100% RH were fairly low. The primary reason for low moisture content was probably that the samples were oven dried prior to the conditioning. Oven drying was required to equalize the MC prior to the 24 h sorption test. The MC after three weeks of conditioning ranged between 5.9% (PaTm) and 19.3% (PaCu) in non-aged specimens. In general, thermally modified spruce and beech wood had a much lower MC than non-modified materials. The better sorption properties of thermally modified wood are well known (Esteves and Pereira 2009; Humar et al. 2014). However, copper treatment resulted in a higher MC of impregnated wood. This phenomenon reflects that boron and copper compounds in impregnated wood are slightly hygroscopic. Furthermore, there were several voids formed that allowed capillary condensation, which resulted in higher moisture contents of impregnated wood (Ramos et al. 2006; Lesar et al. 2009). Similar to the first sorption test, in which specimens were exposed in high humidity for 24 h only, in the second test, various degradation factors did not have a particularly significant influence on MC after three weeks of conditioning. The highest increase of moisture content (MC) was observed with oil-treated spruce wood (PaOl), where MC increased from an original 8.9% to 16.1% with specimens exposed to blue staining. In general, blue staining appears in less durable, susceptible wood species (PsS, Pa, Fs, Ld, LdOl, PaOl and PaWa) (Žlahtič and Humar 2016). With these species, exposure to blue staining resulted in higher MC after exposure to an environment with high humidity. This result confirmed previous reports that blue stained wood had a higher MC than non-stained wood. An interesting phenomenon could be observed with specimens exposed to AAW and outdoor weathering. The MC of wax-treated wood was lower after weathering, while the MC of other wood species increased after weathering (Table 6). For example, the MC of control wax-treated thermally modified wood was 11.7%, while the MC of parallel samples weathered for 18 months was 10.7% only. There was no explanation for this observed phenomenon. Previous research indicated that wax-treated wood has a more hydrophobic surface than oil-treated wood (Žlahtič and Humar 2016), which was tested as the surface properties of wood. Subsequent research based on the moisture dynamics of wood resulted in better oil performance. However, the uptake of oil into wood was much higher than that of waxes (Žlahtič and Humar 2016). Thus, the oil in wood contributed to a higher dry mass, so the same amount of absorbed water in oil-treated wood resulted in lower MC compared to wax and control wood. Moisture dynamics and water exclusion efficacy are two key factors for service life prediction of wood and wood-based materials. There were a series of other tests in progress in the test field for wood in which moisture dynamics was being monitored on the same materials. The results after long-term moisture monitoring will be linked to present data in the future. The present data clearly showed that a single test for elucidation of water exclusion efficacy was not sufficient. To understand the connection between various tests performed, the correlation between various moisture performance test was calculated. Among the different methods applied, the highest correlation was between the long-term water uptake after 1 h and 24 h (r2 = 0.8791) (Fig. 4), which was logical because these two approaches were fairly similar. The second best correlation was between MC after 3 weeks conditioning in 100% RH climate and MC after 24 h in the same climate (r2 = 0.513). This link was also to be expected because both methods were based on the same approach. A similar correlation was noted between long-term water uptake (1 h immersion) and short-term water uptake determined with a tensiometer (r2 = 0.5002). Both of these methods depended on liquid water penetration into wood. This correlation suggested that penetration in an axial direction was key in describing water exclusion efficacy. A slightly less significant correlation was found between tensiometer and 24 h of soaking in distilled water (r2 = 0.4161), or compared to contact angle (r2 = 0.3109) (Fig. 4). Thus, there were a number of factors influencing water penetration. Notably, the penetration of liquid water into wood was completely different from the penetration of water vapor. Various aging/degrading factors influenced the moisture performance of wood, and clearly, they acted synergistically. Hence, the highest decrease of moisture performance was determined with specimens exposed to natural weathering, in which wood was exposed to the whole spectrum of aging factors simultaneously. Water performance of weathered, blue stained wood and partly degraded wood is considerably decreased, what makes it more susceptible to fungal decay. Materials performed differently after aging. Water exclusion efficacy decreased the most prominently with thermally modified spruce and beech wood and less durable materials like spruce, pine sapwood and beech. Wood treated with wax emulsions performed best, regardless of the aging/degradation applied. Wax-treated wood retained its excellent hydrophobic properties after 9 and 18 months of outdoor exposure. This clearly indicates, that wax treated wood could be successfully used in above ground outdoor applications. Our results indicates that moisture performance of wood could not be determined with one type of test only. For assessment of this parameter, a comprehensive methodology consisting of contact angle measurements, liquid water uptake and sorption tests has to be applied. The authors acknowledge the support of the Slovenian Research Agency within the framework of project L4-5517, L4-7547, program P4-0015, and the infrastructural center for preparation, weathering, and field-testing of wood and lignocellulosic materials (IC LES PST 0481-09). The work was part financed by the European Union, project ‘WINdow based on THERmally modified wood with high performance WAX coating’ (WINTHERWAX, 666206). Banks, W. B. (1972). “Factors affecting the introduction of preservatives into wood,” Pesticide Science 3, 219-227. Brischke, C., Alfredsen, G., Flæte, P. O., Humar, M., Isaksson, T., and Meyer, L. (2015). The Combined Effect of Wetting Ability and Durability on Field Performance – Verification of a New Prediction Approach (IRG/WP 15-20565), International Research Group on Wood Preservation (IRG), Stockholm, Sweden. Brischke, C., Welzbacher, C. R., Meyer, L., Bornemann, T., Larsson-Brelid, P., Pilgård, A., Frühwald Hansson, E., Westin, M., Rapp, A. O., Thelandersson, S., and Jermer, J. (2011). Service Life Prediction of Wooden Components—Part 3: Approaching a Comprehensive Test Methodology (IRG/WP 11-20464), International Research Group on Wood Protection, Stockholm, Sweden. Connell, M. (2004). Issues Facing Preservative Suppliers in Changing Market for Treated Wood (COST E22), Environmental Optimisation of Wood Protection, Brussels, Belgium. EN 113 (2006). “Wood preservatives – Test method for determining the protective effectiveness against wood-destroying basidiomycetes. Determination of toxic values,” European Committee for Standardization, Brussels, Belgium. EN 1609 (1997). “Thermal insulating products for building applications – Determination of short term water absorption by partial immersion,” European Committee for Standardization, Brussels, Belgium. EN 335 (2013). “Durability of wood and wood-based products—Use classes: Definitions, application to solid wood and wood-based panels,” European Committee for Standardization, Brussels, Belgium. EN 350 (2015). “Durability of wood and wood-based products—Testing and classification of the resistance to biological agents, the permeability to water and the performance of wood and wood-based materials,” European Committee for Standardization, Brussels, Belgium. ENV 1250-2 (1994). “Wood preservatives – Methods for measuring losses of active ingredients and other preservative ingredients from treated timber – Part 2: Laboratory method for obtaining samples for analysis to measure losses by leaching into water or synthetic sea water,” European Committee for Standardization, Brussels, Belgium. Hartley, I. (2011). “Wood: Moisture content, hygroscopicity, and sorption,” in: Encyclopedia of Materials: Science and Technology, K. H. J. Buschow, R. W. Cahn, M. C. Flemings, and B. Ilschner, Elsevier, Amsterdam, The Netherlands, pp. 9668-9673. Humar, M., and Pohleven, F. (2008). “Solution for wood preservation,” European Patent EP 1791682 B1 20080903 (EN). Humar, M., Vek, V., and Bučar, B. (2008). “Properties of blue-stained wood,” Drvna Industrija 59(2), 75-79. Humar, M., Žlahtič, M., and Thaler, N. (2014). “Influence of thermal modification of Norway spruce wood on short and long term water uptake,” in: Proceedings of the 7th European Conference on Wood Modification, Lisbon, Portugal, pp. 10-12. Kumar, S. (1994). “Chemical modification of wood,” Wood and Fiber Science 26, 270-280. Lesar, B., and Humar, M. (2010). “Service life prediction of wood treated with wax emulsions and copper amine based solutions exposed in third use class,” Zbornik Gozdarstva in Lesarstva 93, 23-35. Lesar, B., and Humar, M. (2011). “Use of wax emulsions for improvement of wood durability and sorption properties,” European Journal of Wood and Wood Products 69, 231-238. Lesar, B., Gorišek, Ž., and Humar, M. (2009). “Sorption properties of wood impregnated with boron compounds, sodium chloride and glucose,” Drying Technology 27(1), 94-102. Lesar, B., Pavlič, M., Petrič, M., Sever Škapin, A., and Humar, M. (2011). “Wax treatment of wood slows photodegradation,” Polymer Degradation and Stability 96(7), 1271-1278. Ma, E. N., and Zhao, G. J. (2012). Special Topics on Wood Physics, China Forestry Publishing House, Beijing, China, p. 90. Meyer, L., Brischke, C., Treu. A., and Larsson-Brelid, P. (2015). “Critical moisture conditions for fungal decay of modified wood by basidiomycetes as detected by pile tests,” Holzforschung 70(4), 331-339. Militz, H. (2015). “Wood modification in Europe in the year 2015: A success story?,” in: Proceedings of the Eighth European Conference on Wood Modification, Helsinki, Finland, pp. 17-19. Pétrissans, M., Gérardin, P., El bakali, I., and Serraj, M. (2003). “Wettability of heat treated wood,” Holzforschung 57, 301-307. Ramos, A. M., Calderia, J. F., and Botelho, C. (2006). “Boron fixation in wood: Studies of fixation mechanisms using model compounds and maritime pine,” Holz als Roh und Werkstoff 64, 445-450. Rep, G., Pohleven, F., and Košmerl, S. (2012). “Development of the industrial kiln for thermal wood modification by a procedure with an initial vacuum and commercialisation of modified Silvapro wood,” in: Proceedings of the 6th European Conference on Wood Modification, Ljubljana, Slovenia, pp. 11-17. Rowell, R. M. (2012). Handbook of Wood Chemistry and Wood Composites, Second Edition, CRC Press, Boca Raton, FL, USA. Rowell, R. M., and Banks, W. B. (1985). Water Repellency and Dimensional Stability of Wood (Gen. Tech. Rep. FPL-50), U.S. Department of Agriculture, Forest Products Laboratory, Madison, WI. Scheffer, T. C. (1971). “A climate index for estimating potential for decay in wood structures above ground,” Forest Products Journal 21(10), 25-31. Schmidt, O. (2006). Wood and Tree Fungi: Biology, Damage, Protection, and Use, Springer-Verlag, Berlin, Germany. Scholz, G., and Militz, H. (2011). “Materialeigenschaften wachsimprägnierten Holzes [Material properties of wax-impregnated wood],” Holztechnologie 52(6), 29-33. Stamm, A. J. (1964). Wood and Cellulose Science, Ronald Press Co., New York, NY. Van Acker, J., De Windt, I., Li, W., and Van den Bulcke, J. (2014). Critical Parameters on Moisture Dynamics in Relation to Time of Wetness as Factor in Service Life Prediction (IRG/WP 14-20555), International Research Group on Wood Preservation (IRG), Stockholm, Sweden. Van Acker, J., Van den Bulcke, J., De Windt, I., Colpaert, S., and Li, W. (2015). “Moisture dynamics of modified wood and the relevance towards decay resistance,” in: 8th European Conference on Wood Modification (ECWM8), Helsinki, Finland, pp. 44-55. Williams, R. S., and Feist, W. C. (1999). Water Repellents and Water Repellent Preservatives for Wood (Gen. Tech. Rep. FPL–GTR–109), U.S. Department of Agriculture, Forest Products Laboratory, Madison, WI. Wu, G. J., and Zhang, D. (1999). “Development of water-repellent for fibre-board and particle-board in China,” Forest Industry 26(4), 6-8. Article submitted: July 15, 2016; Peer review completed: August 28, 2016; Revised version received and accepted: October 31, 2016; Published: November 8, 2016.